← Is this the QE you were looking for? 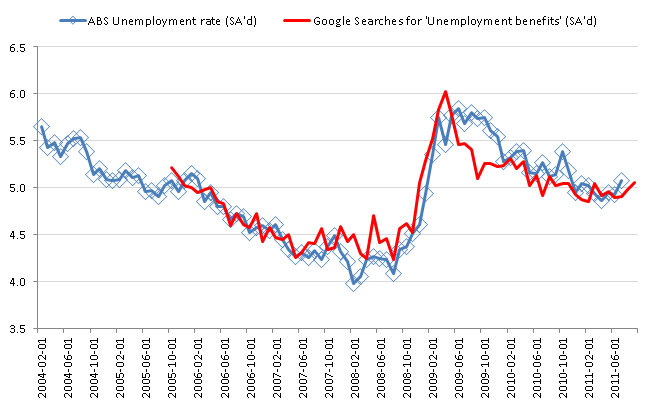 Given the media reports of redundancies, it comes as no surprise that google searches for “unemployment benefits” are trending up. For July, our google index said the unemployment rate ought to be ~5%, and it was 5.1%; for August, the forecast is ~5.05%, so the unemployment rate could go either way (my guess is that it’ll remain at 5.1%). The turn in the trend, due to the pickup in searches in the early September data suggests that it should remain at 5.1% or maybe head a little higher, come September. In this post I have included Google’s estimate of searches over the month of September, despite the fact that it’s partial data, as it helps build a (plausible) story about a turn in the labour market. That story fits with the recent weakness in job ads, as well as various media reports of redundancies. The net-searchers are broadly dispersed across the nation. 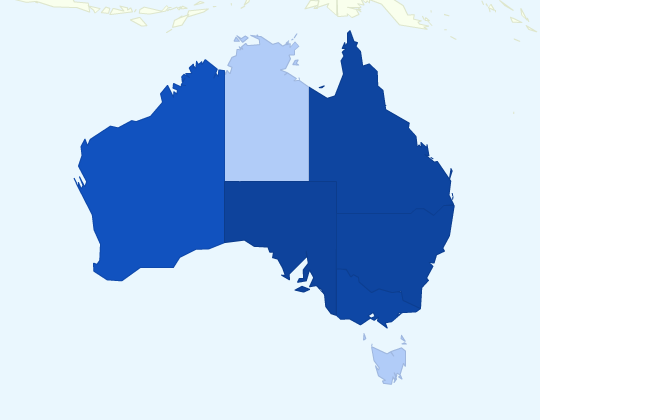 South Australia is now the most searching State; they have over-taken Queensland (which ought to be getting a lift from the mining boom pretty soon). Will the RBA react? I doubt it. They can’t do anything about weak productivity – so i take their comments on the matter to mean that they want a higher unemployment rate. My answer to the full employment question would be: I think the bank has fulfilled that side of its mandate, recognising of course that a sustainable unemployment rate ultimately is a function of industrial relations matters, not monetary policy. That is directly related to minimum wages of which we have possibly the highest in the Western World. And with the current exchange rate, possibly average wages too. Ought to be, should be, will be … does mining (and related sectors) really employ that many people? Can it ever offset the weakness in big employers like manufacturing, retail and (in Queensland) tourism? Your Google survey is a bit of fun but I doubt it bears much relationship to the ABS employment numbers, which are all over the place anyway and have a huge MoE. But that won’t stop the media “analysing” the numbers one way or another later today! It was never intended that mining should offset falling employment (which we have not seen in any great numbers to date) in retail, manufacturing or tourism. 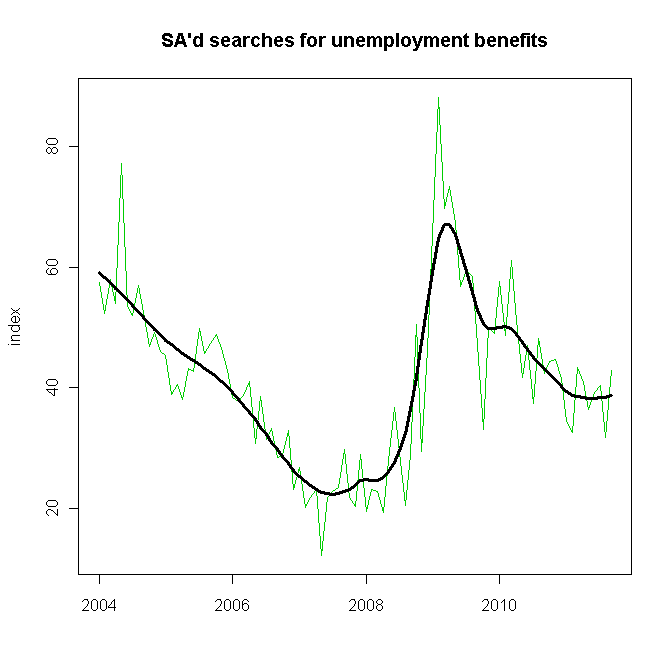 Increases in unemployment have been very modest, this may change, certainly has changed elsewhere in other economies. I suspect many economies would gladly have growing demand for something, anything – at least we have that. I think this analysis you perform every month is very innovative, thank you very much for make it public. I guess the correlation is not that close, especially month to month, plus the ABS seasonally adjusted unemployment rate has a margin of error of +/- 0.2% so we could still be at 5.1% or at 5.5% ! Add to that that if you work 1 hour in a week you are considered employed and you see that these month to month numbers do not have that much significance. I am interested in learning more re the gross flows data. Where can I find that in the ABS release? All we can really say about the employment numbers is employment growth has clearly stalled over the past six months and might be tipping over. Note: July was revised down by 8,000, so the 10,000 jobs lost are from an already revised-down number. Today’s number is 18,000 lower than the pre-revision July number, and 28,000 lower than market expectations of July + 10,000. ABS notes on sampling error: At 95% confidence level employment could have fallen by 64,300 or risen by 44,900. Imagine what Chris Joye and Adam Carr would be saying now if the number was at the high end, or what Minack et al would be saying if the number was at the low end? Monthly numbers are pretty meaningless really. Its the trend that matters. Interestingly, the ABS says that 30,000 Census field workers were employed in August. Now if a third of these workers had no prior employment, this is starting to get closer to a statistically significant drop in employment. Still within the MoE mind. The survey is not designed to measure employment. It is designed to measure the unemployment rate. It does well at that task, but poorly at measuring employment. If that is what you want, you need an establishment survey. Interestingly, thie hazard rates (from the gross flows data) looked better this month than last month. I think these are also well estimated. So we have an increase in joblessness driven by Qld (fx killing tourism? ), and I think it is probably real. The good news is that there are special factors in Qld (mining and rebuild) that will probably pick up the slack. Tourism employs 500,000 in Australia, with maybe 200,000 of those in Qld. How many of those are going to get jobs in the Qld coal mines? Jobs in Qld coal mines – they are not – whatever made you think they would! True, it has been weaker than most expected, weaker than Treasury’s forecasts too I should think, though parkie may not have subscribed to them. I have been thinking about this a bit lately, what do you think we got wrong, and what do you think are the signs that we missed? The unemployment rate seems to have “spiked” in the areas with most significant housing weakness, that is QLD and WA. The mining boom is not adding the jobs that are needed to replace those which are going to be lost as a result of the structural change associated with the high Australian dollar or the cyclical changes resulting from tight monetary policy and the intention of government, households and firms to lower debt. Those folks who point to the mining boom generating wage pressures, as strong demand for labour impacts a tight labour market, must be reassessing. Recall that the Reserve Bank has forecast that the unemployment rate will be lower in 2012 than the 4.9 per cent which it registered at its last forecasting round. Stresses in the retail (15 per cent of employment); manufacturing (10 per cent); finance (7 per cent); leisure (7 per cent) and construction (9 per cent) sectors are unlikely to be absorbed by the mining sector (2 per cent). A recent RBA report calculated that the construction activities in the mining sector over the last year boosted employment by only 0.25 per cent. Measures of the indirect effect of mining demand on business services; finance; and manufacturing are not available, but it appears that this effect has been over-stated by the interest rate hawks. Furthermore, the income effect which was so important in the previous mining boom has not been apparent in this cycle as government, households and firms have been saving any income boost. That income boost is likely to come to an end later this year and in 2012 as commodity prices fall. Third or forth attack on the mining industry! A little zealous (and misguided). Economies around the globe are experiencing a range of challenges, we may also. It is a far broader issue than that on which you seem transfixed. i agree with your assessment. there seems to be a global slow-down afoot just now. the only economy apparently spared is NZ, and i suspect that’s just a question of the lag to get there – and of course the stats NZ lag (they are painfully slow to collate and publish data). hours worked have been steadily increasing. Employers are obviously wary about world conditions, given the idiotic policies in Europe and up until last night in the US they were correct. Obama’s stimulus is surprisingly better than I expected.